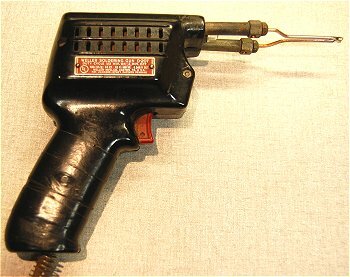 Soldering guns appeared just after World War II when Carl Weller introduced the first "Speedy Iron" instant heat soldering gun. 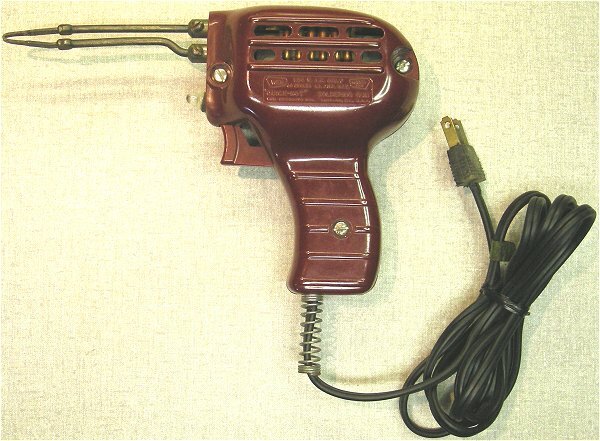 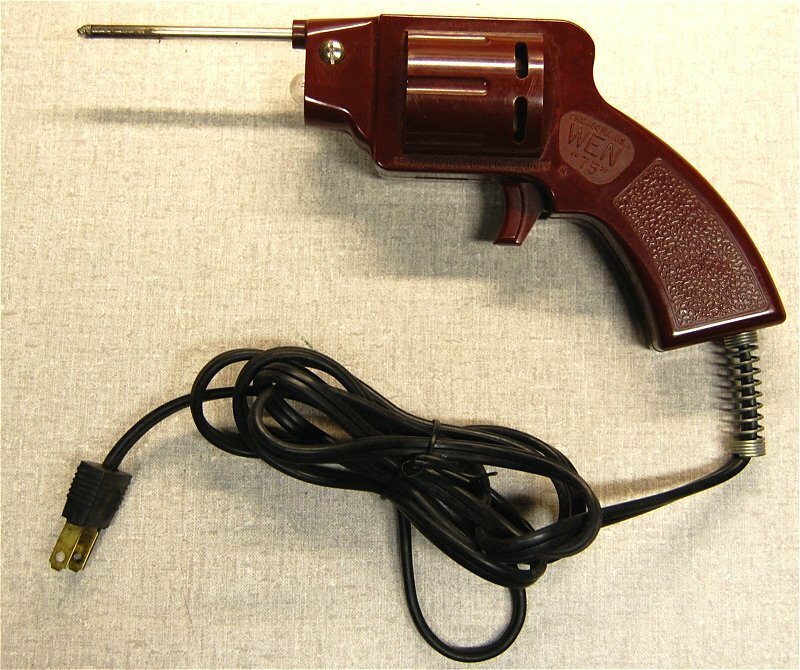 Although many electric soldering irons were shaped like guns, I only consider it a gun if the trigger turns it on and/or controls the heat. 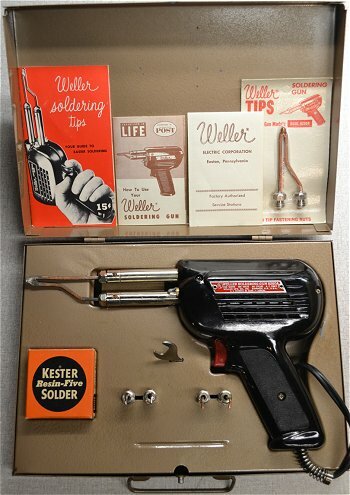 Weller began manufacturing soldering guns in his basement in 1945. Incorporating a step-down transformer and a copper tip gave his new soldering gun the ability to deliver heat quickly and also cool quickly. This made it instantly popular for field service as there was no waiting for it to heat before use or cool before putting it back in the tool box. 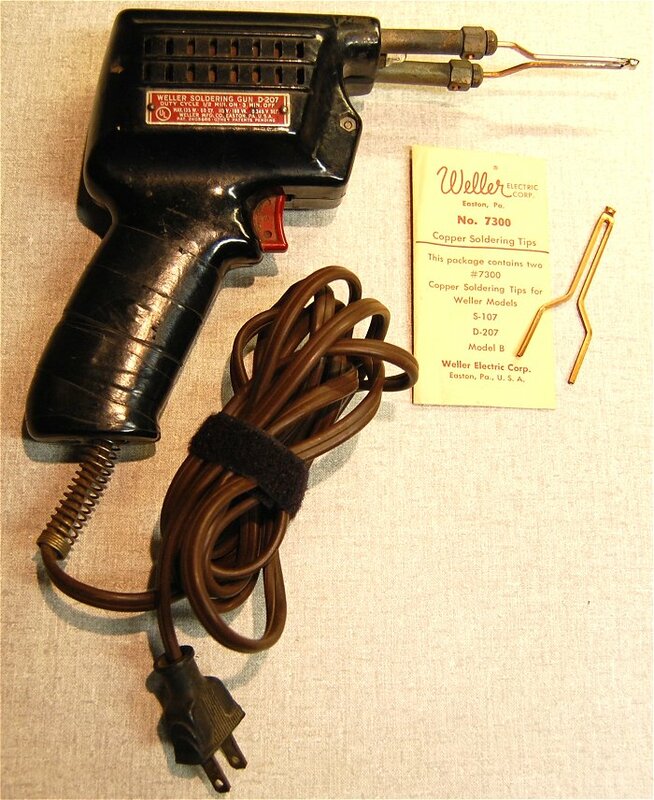 Weller received the patent for his new soldering gun in 1946. 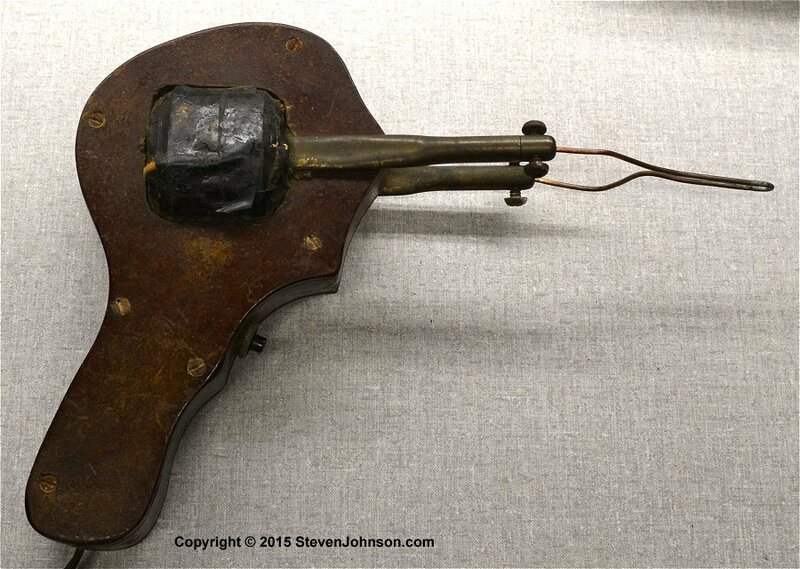 I have obtained a photo of the wooden gun the Smithsonian has on display. 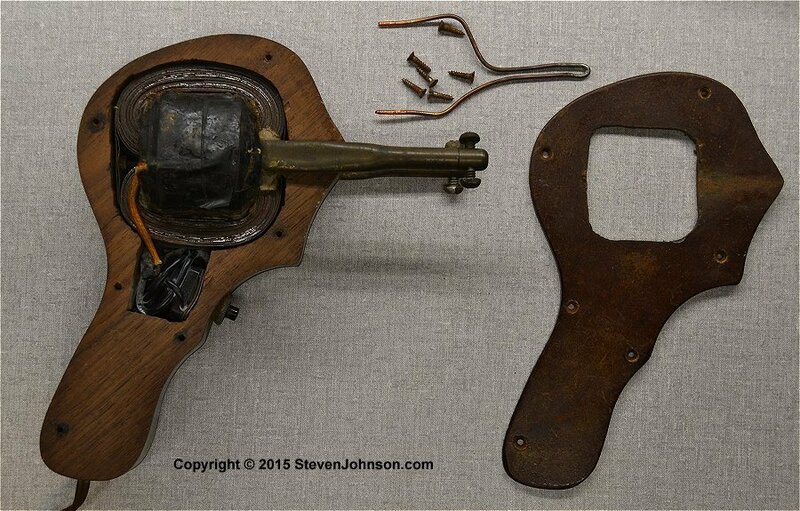 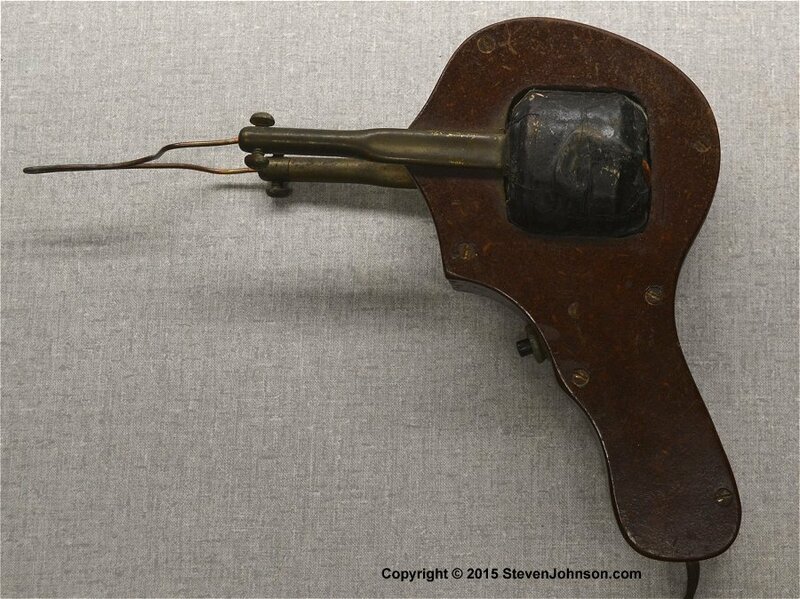 It is cataloged as a prototype of Weller's first commercial gun, the Speedy Iron Model B. I don't have permission to post the photo yet but it is the same shape as the model B but with a case made from wood. 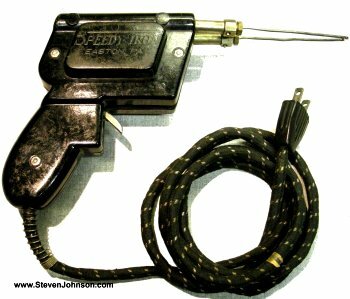 Pictured is the earlist Speedy Iron I have. 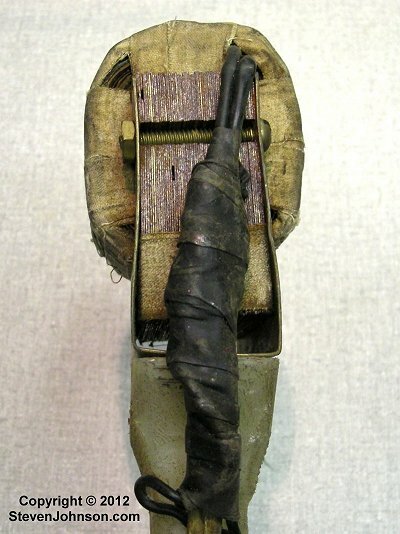 It still works. 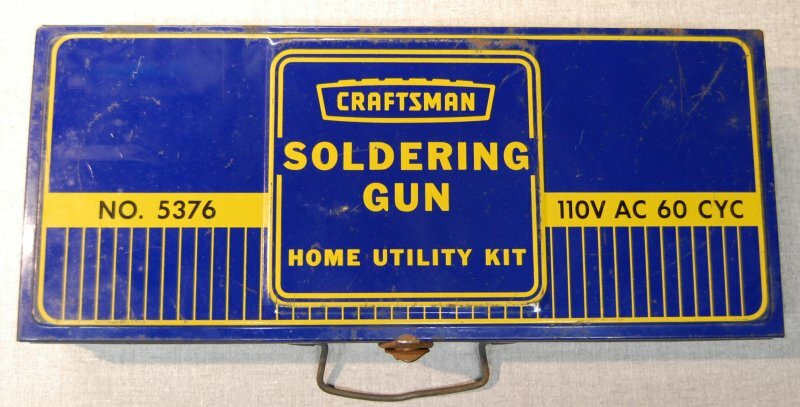 This soldering gun was obviously hand made. 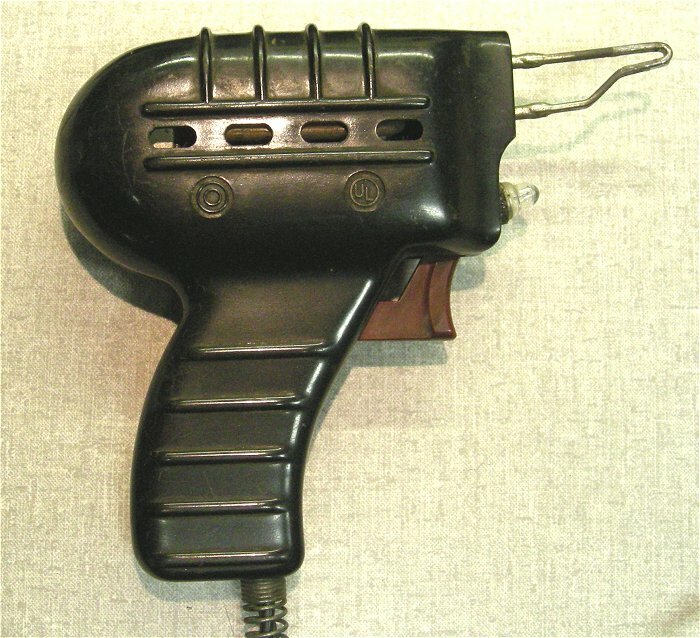 It utilizes a step-down transformer. 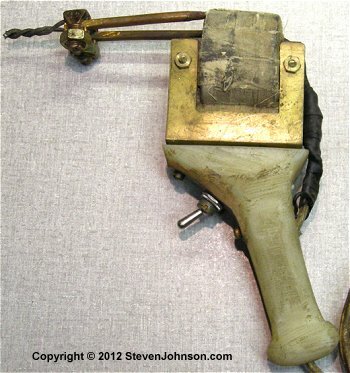 It was found at an estate sale in Pennsylvania. 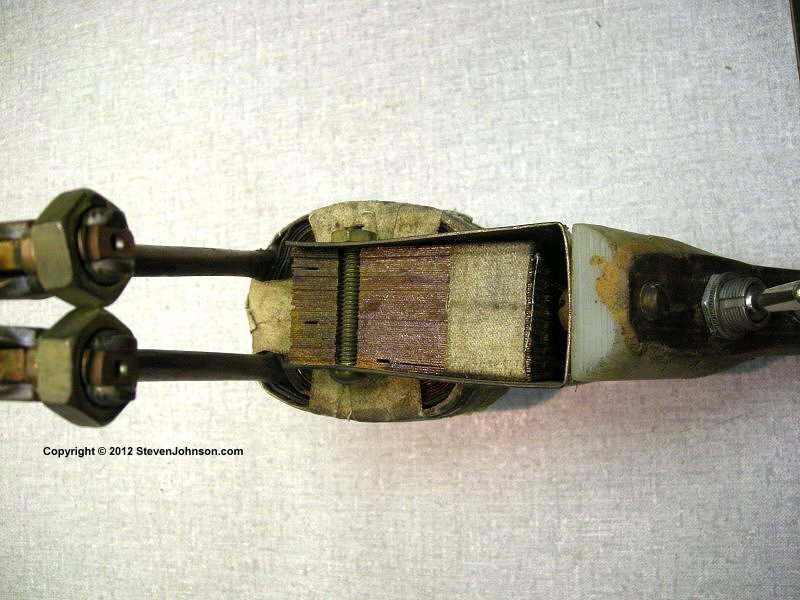 Carl Weller made 275 wooden prototypes in his Easton PA basement and sold them to radio shops before he opened up his manufacturing plant. 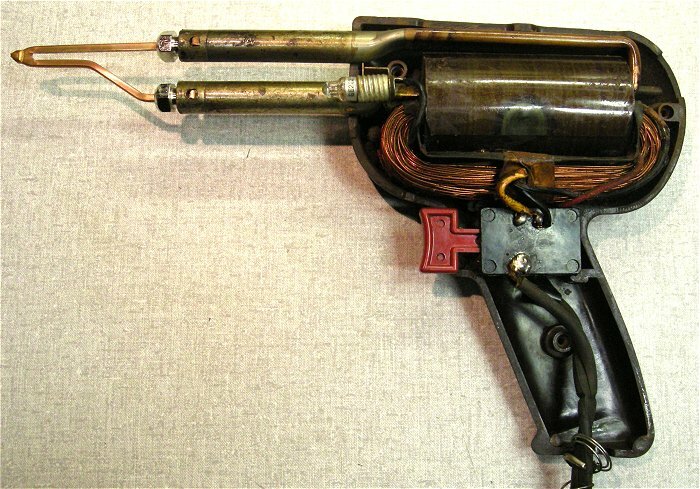 I have no further details on this gun. 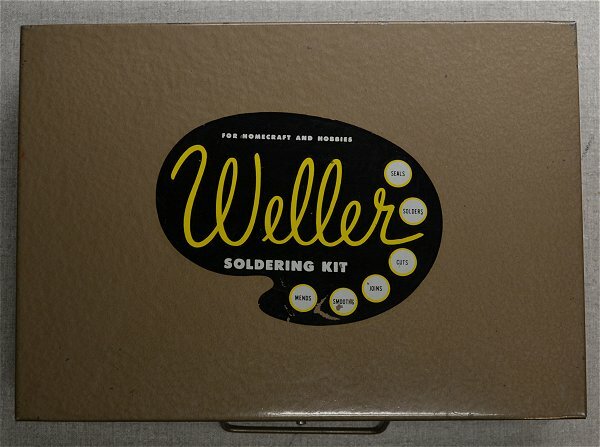 Could this be one of Weller's very early prototypes? 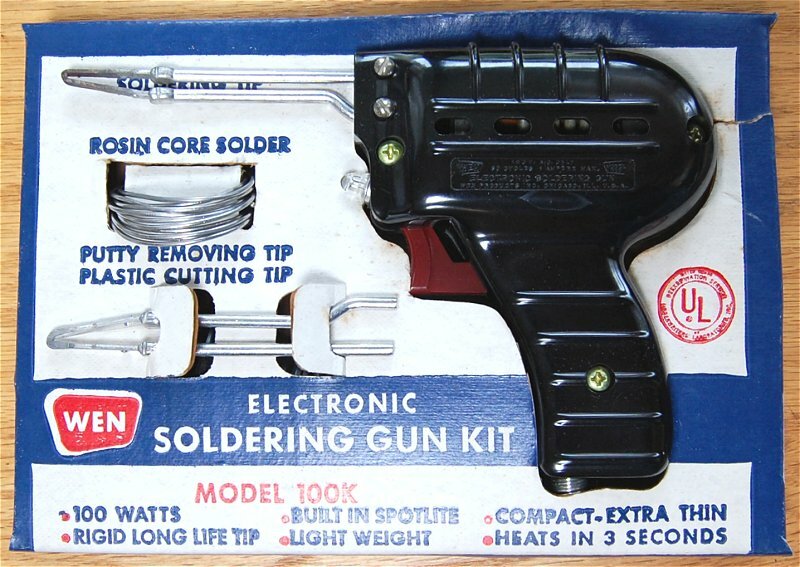 Someone put a lot of work into building this soldering gun. 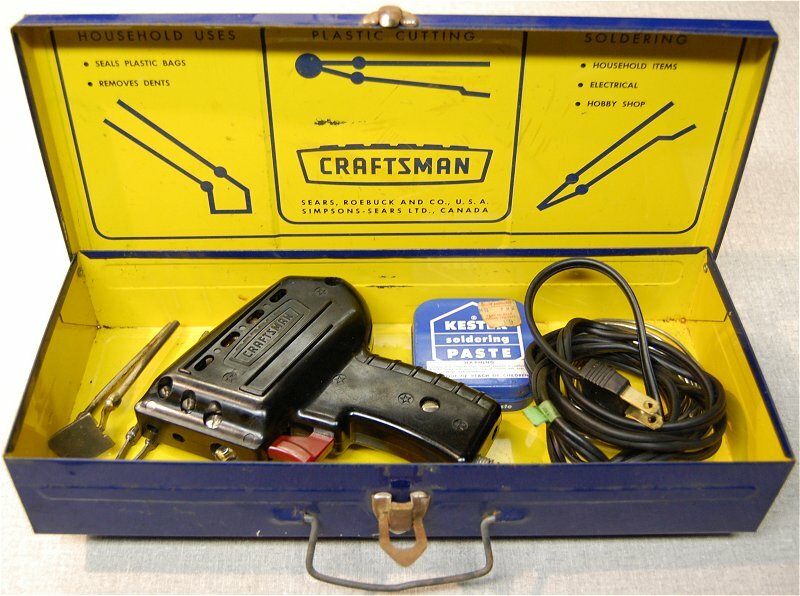 If anyone has a similar handmade soldering gun or remembers Wellers first wooden guns please contact me. 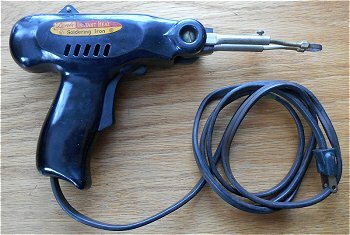 This soldering gun was obviously hand made also. 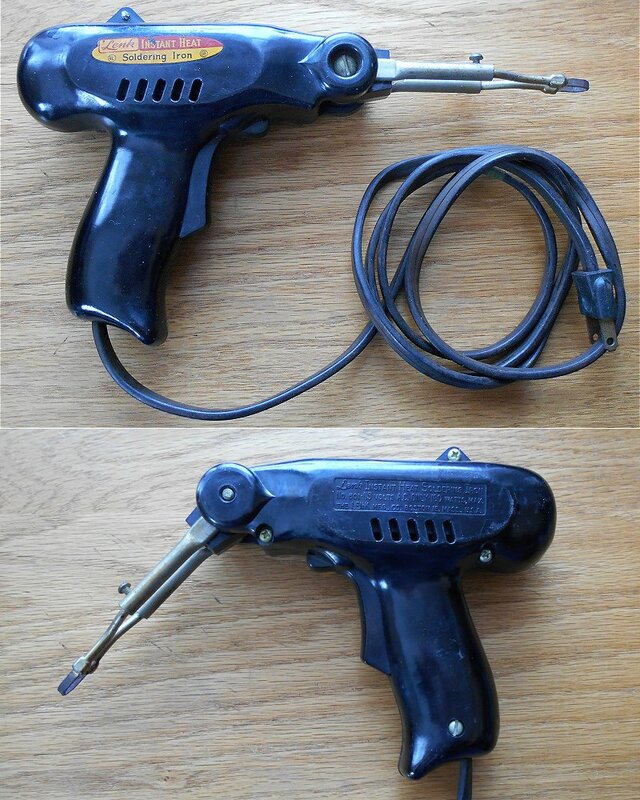 The handle seems to be made out of some type of heavy plastic. It utilizes a step-down transformer. Another of Weller's early style of soldering guns. 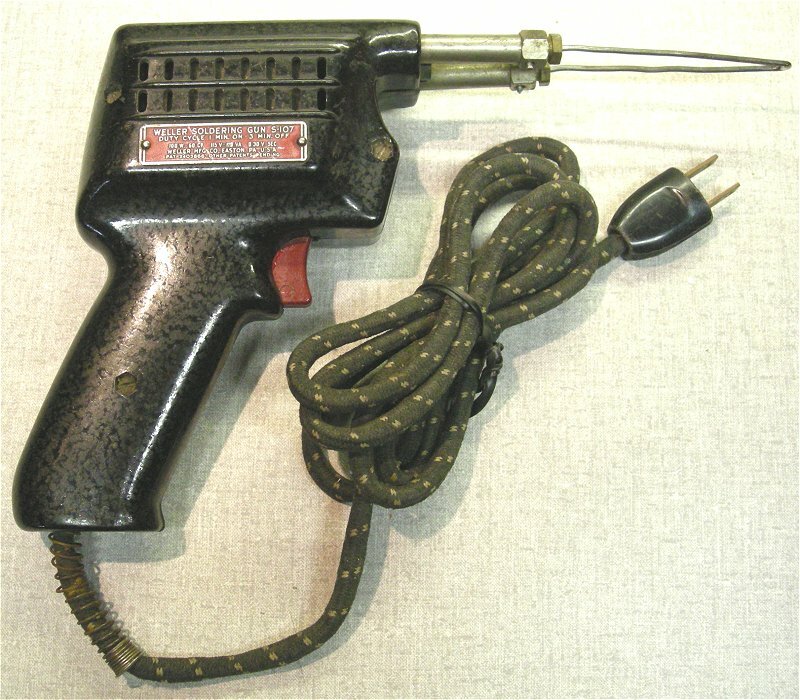 This S-107 is the 100 watt single heat version of the D-207. This Sears Craftsman soldering gun has an on/off trigger, light, and a knob on the back to select between 100 and 130 watts. 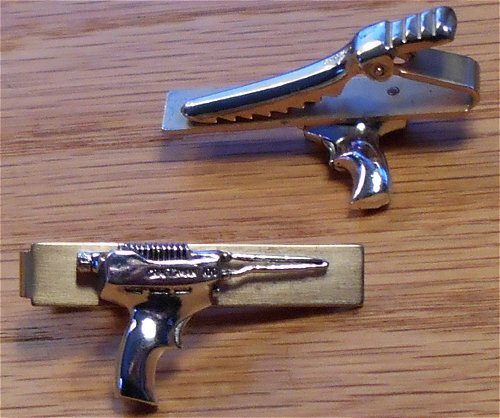 The tie clip shown below sports the Craftsman model 100 soldering gun. 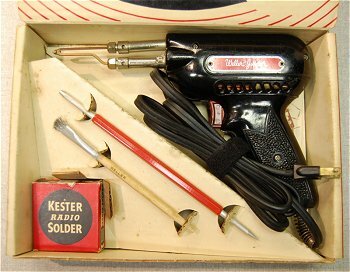 This is a home soldering gun kit sold by Sears that contained a soldering gun and three tips. This is a home electrical soldering gun kit sold by Sears that contained a soldering gun with four tips. 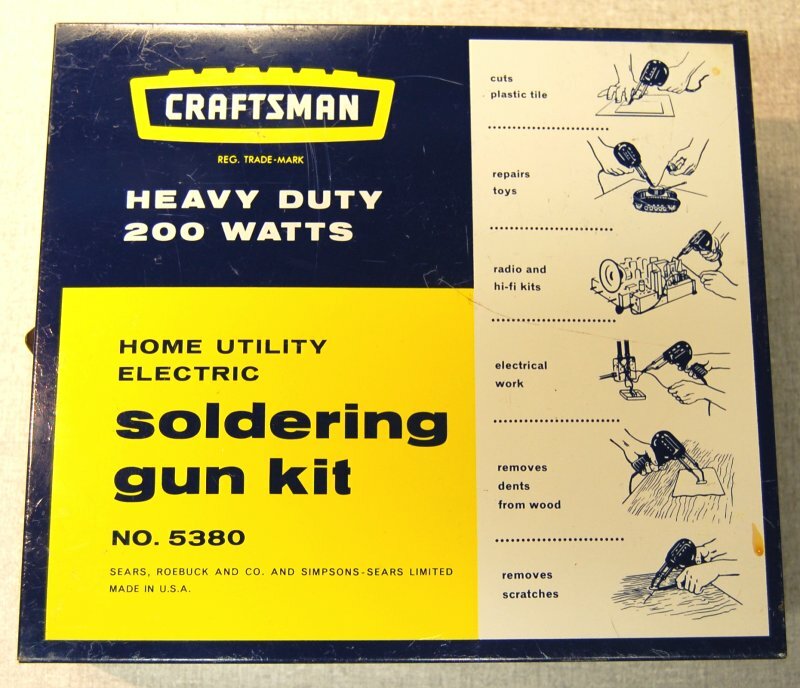 The Craftsman 5400, 135 watt Soldering Gun was manufactured by Weller for Sears. 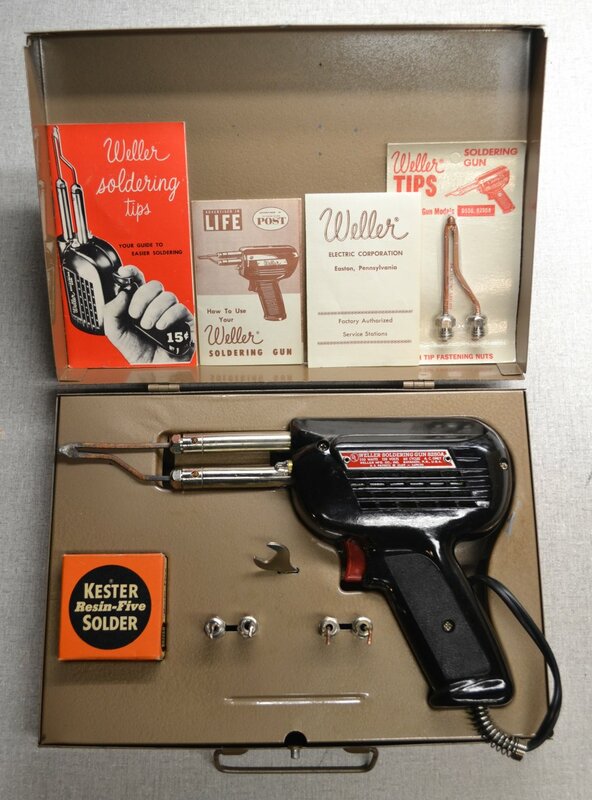 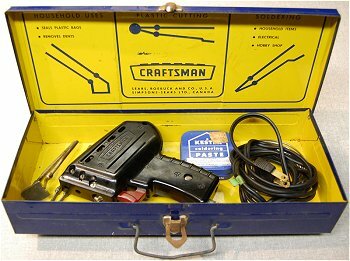 It is the exact same model as the Weller WD-135 soldering gun listed above but has a Craftsman badge on both sides. Drake model 900, 135 watt soldering gun. 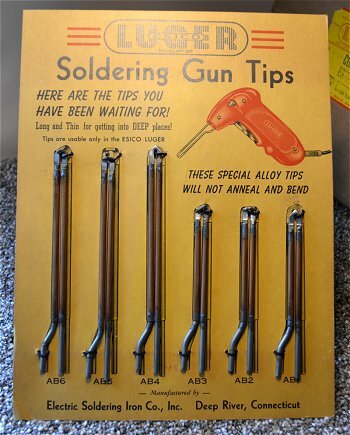 I'm pretty sure the 6 inch tip is homemade from solid copper wire. 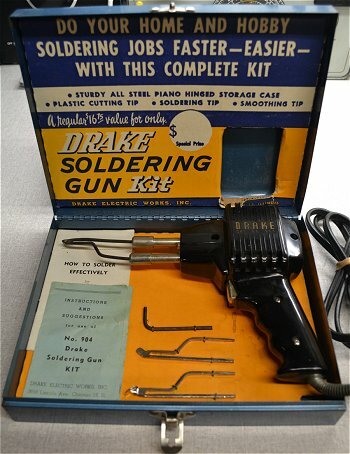 This kit contains the Drake model 905, 250 watt soldering gun, tips, and instructions in a metal box. 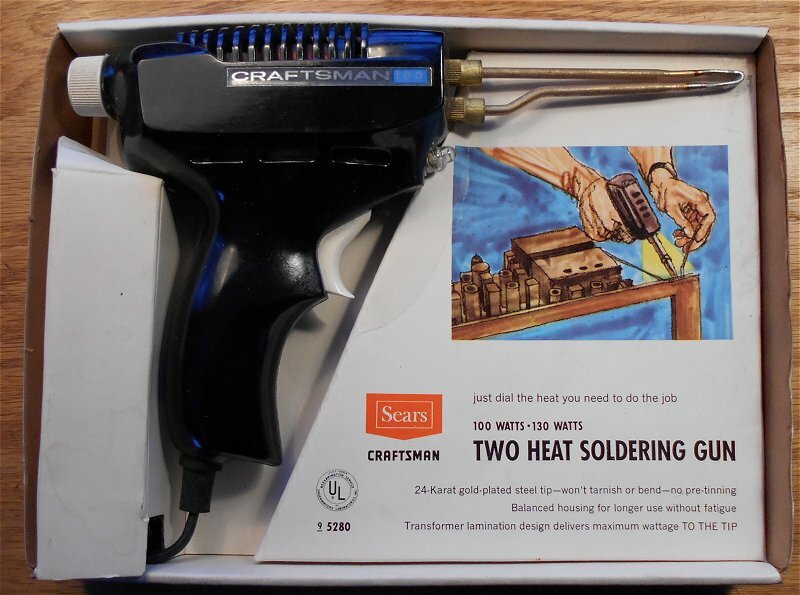 The HexAcon G14 150 watt soldering gun touts it's lightweight (8 oz.) 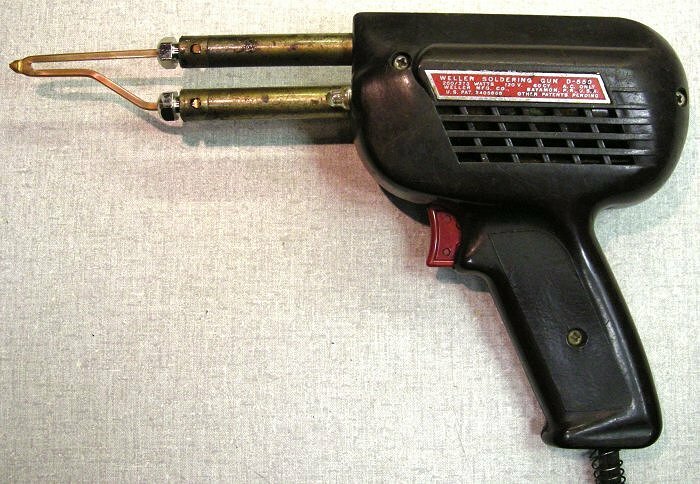 and it's lack of a bulky transformer. 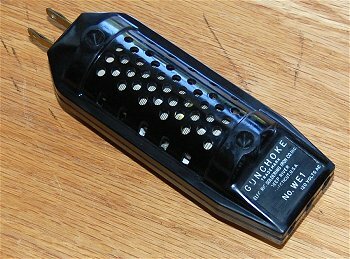 It does heat within a few seconds but even after cleaning I could not tin the tip. 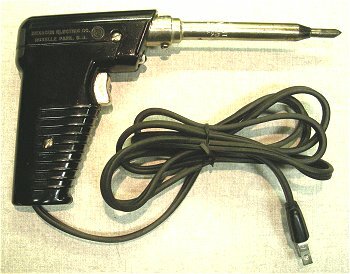 This HexAcon G14 soldering gun was sold in 1956 and cost $3.97. 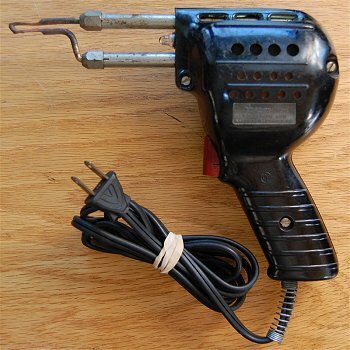 The Lenk 501 soldering gun is 180 watts. 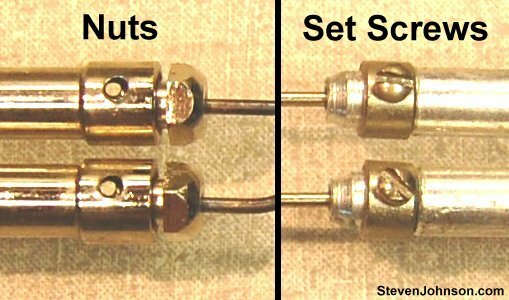 The 501's illuminated tip (GE #222 bulb) rotates in an upward or downward angle. 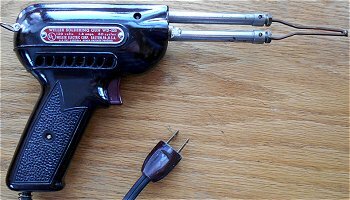 The bulb can be also be adjusted to aim directly at the point being soldered. This Lenk LG 400 (w/400 TE tip) soldering gun is a 150 watt gun. 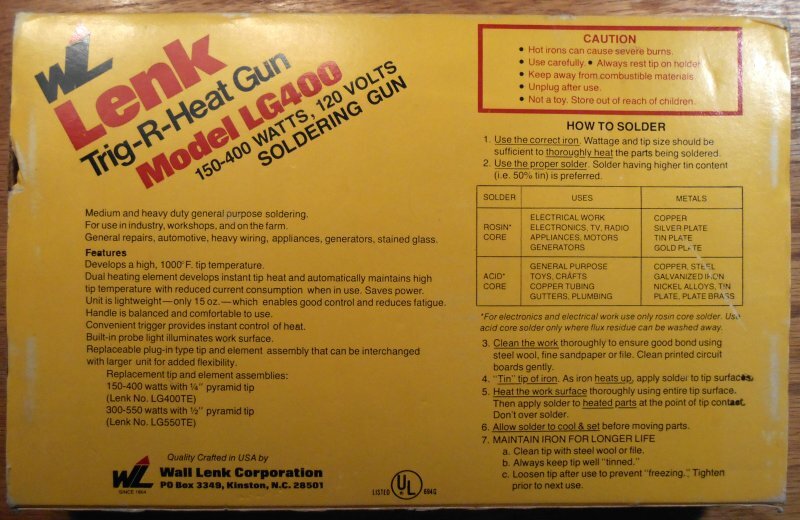 It starts at 400 watts until the tip reaches temperature then runs at 150 watts during soldering. 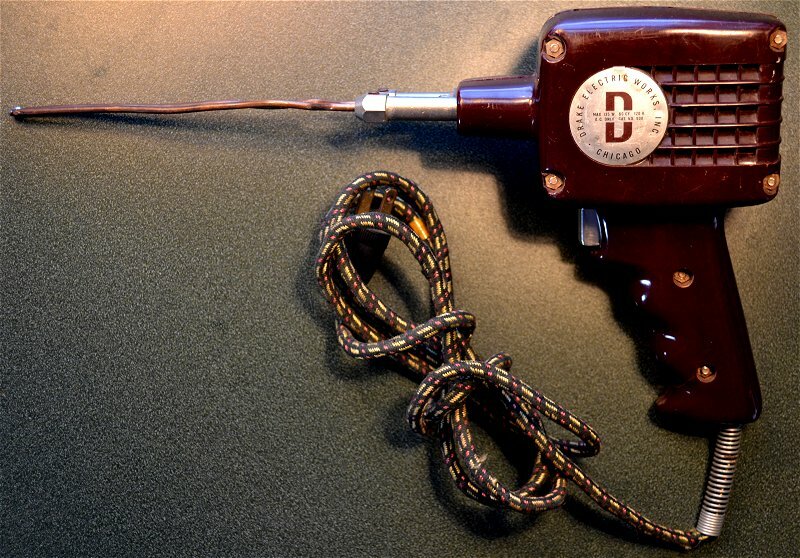 It uses a standard 120 volt, 7 watt night light bulb to illuminate the work area. 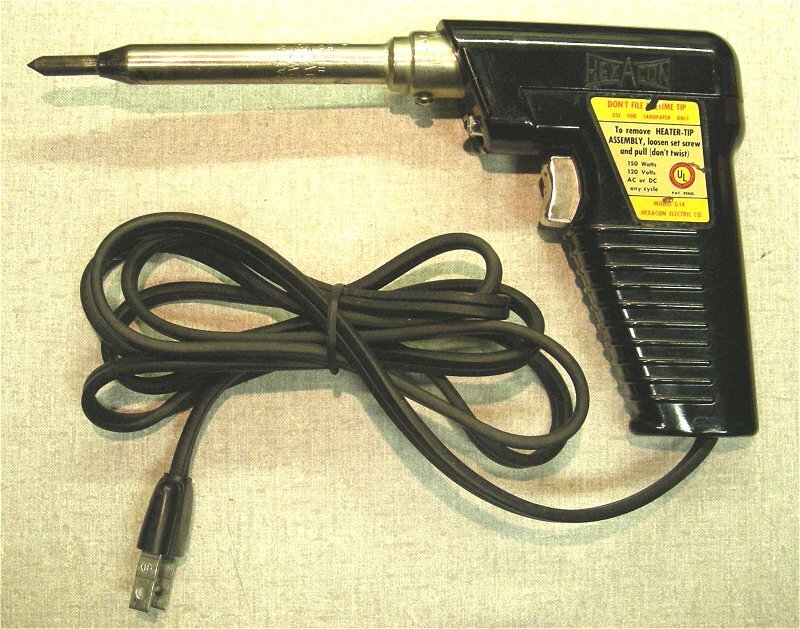 After the Weller 8200 series guns, this is probably the second most popular soldering gun used in manufacturing. 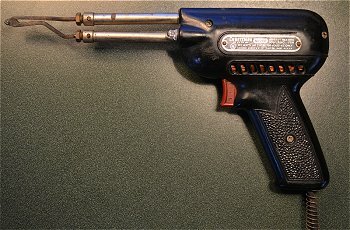 I have seen this gun with different manufacturers logos including the RCA logo. 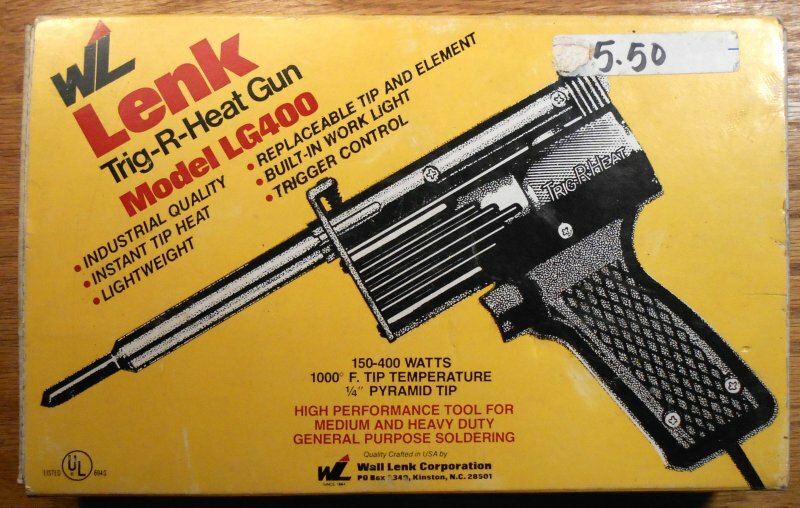 It is still manufactured by the Wall Lenk Corp., Kinston NC. OK, so I guess from the shape it's not a gun, it's a pistol. 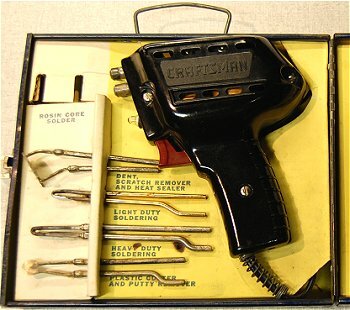 Dates from around 1965. 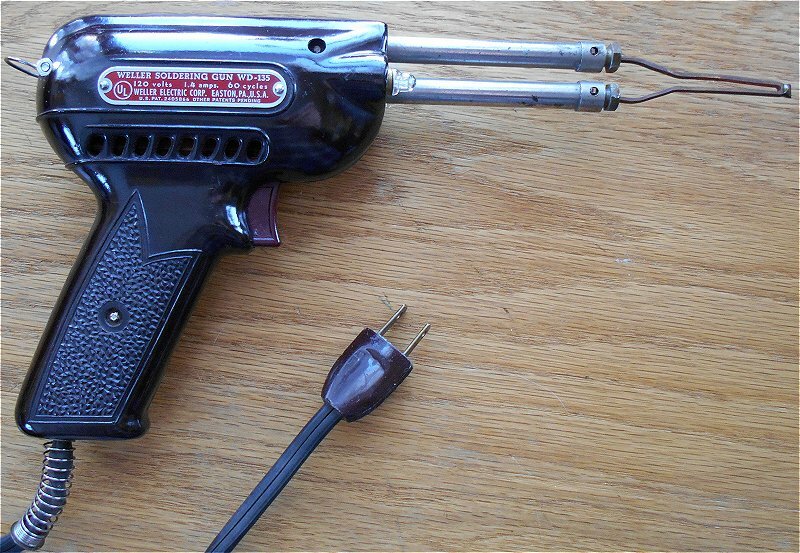 It's 50 Watts and features a work spotlight, trigger switch, and a comfortable pistol grip. 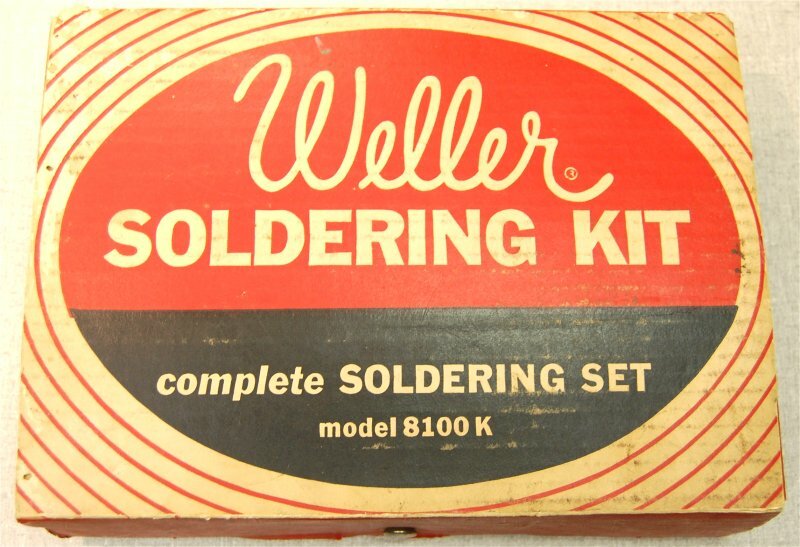 I doubt a serious tech would be seen with this one but if you are seven and learning how to solder this would be cool. 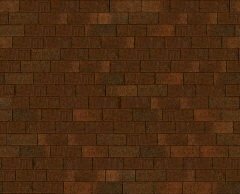 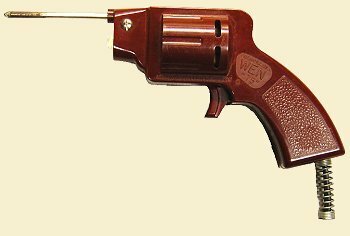 Manufactured by WEN Products Inc. Chicago IL. 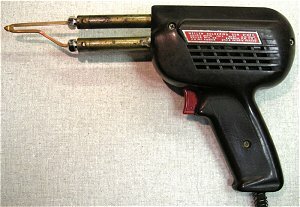 Model 100 soldering gun sold by WEN Products Inc. Chicago IL. 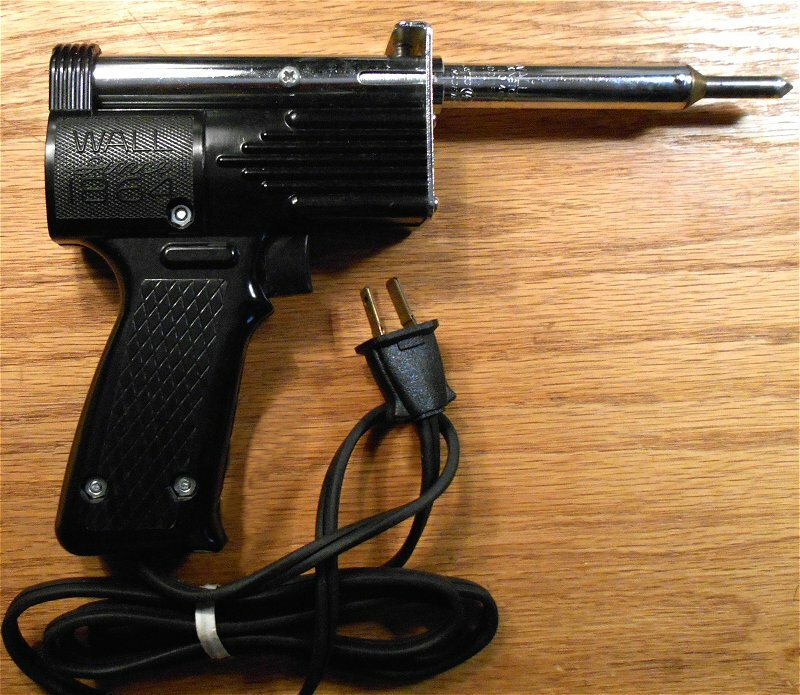 Kind of a stubby little thing. 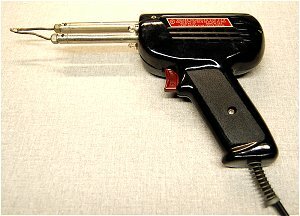 It takes a minute or so to heat up. 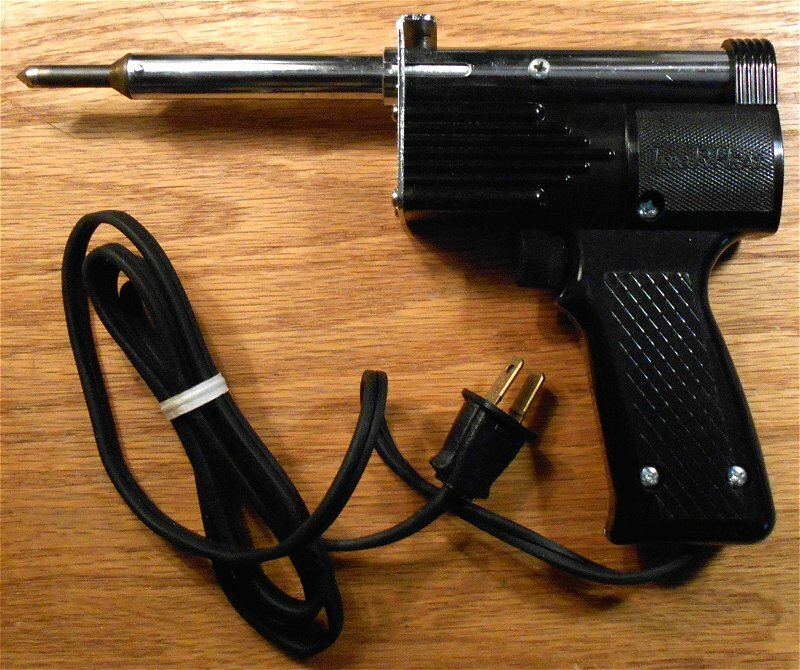 Looks like an earlier version of the model 100 gun in the 100K kit below with a shorter tip. 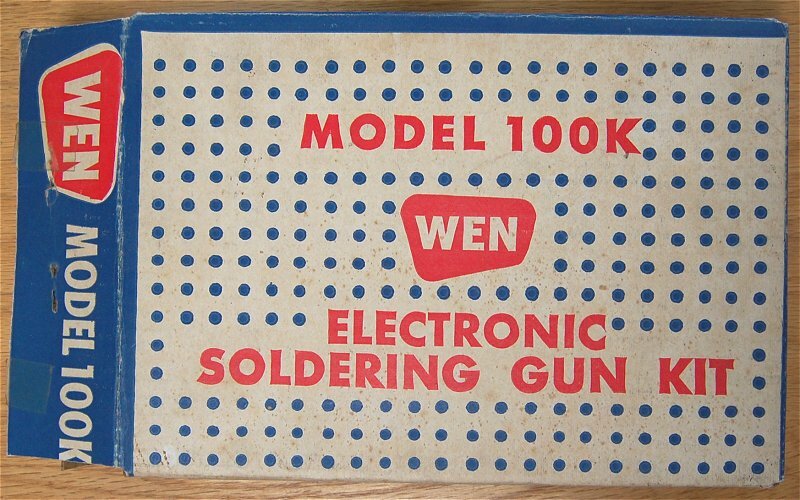 Model 100K soldering gun kit sold by WEN Products Inc. Chicago IL. It contained the Wen model 100 (100 watt) gun, a soldering tip, and a cutting tip along with rosen-core solder. 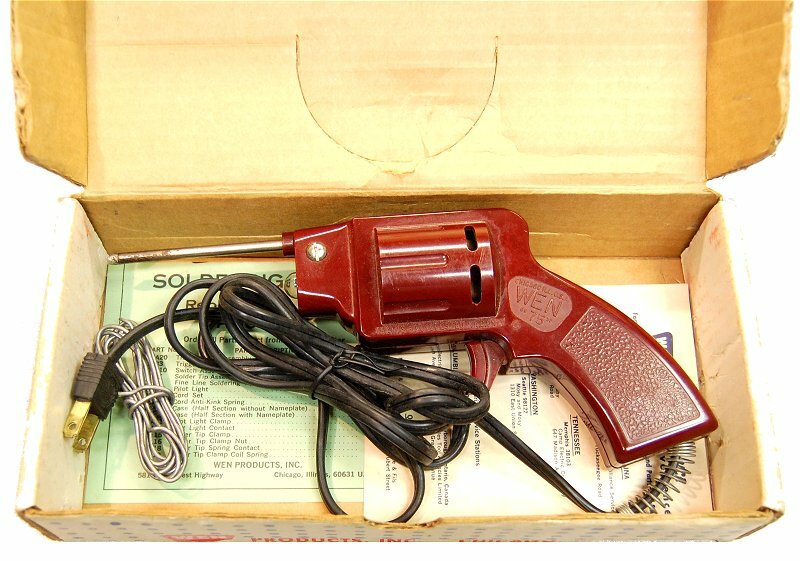 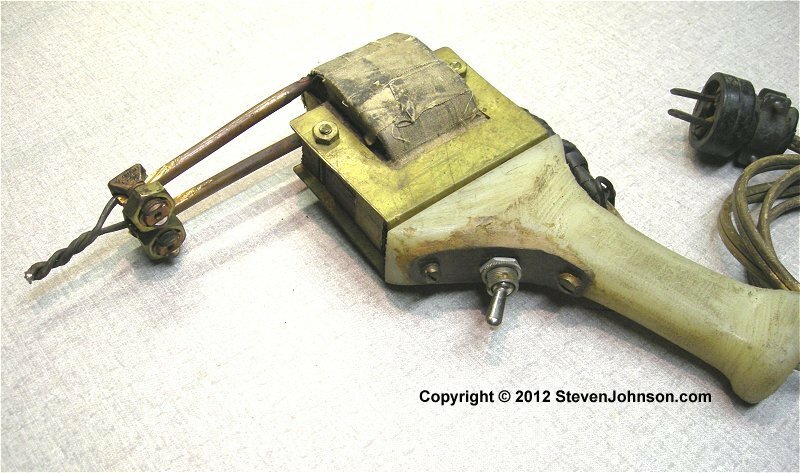 Model 199 (130 watt) soldering gun sold by WEN Products Inc. Chicago IL. 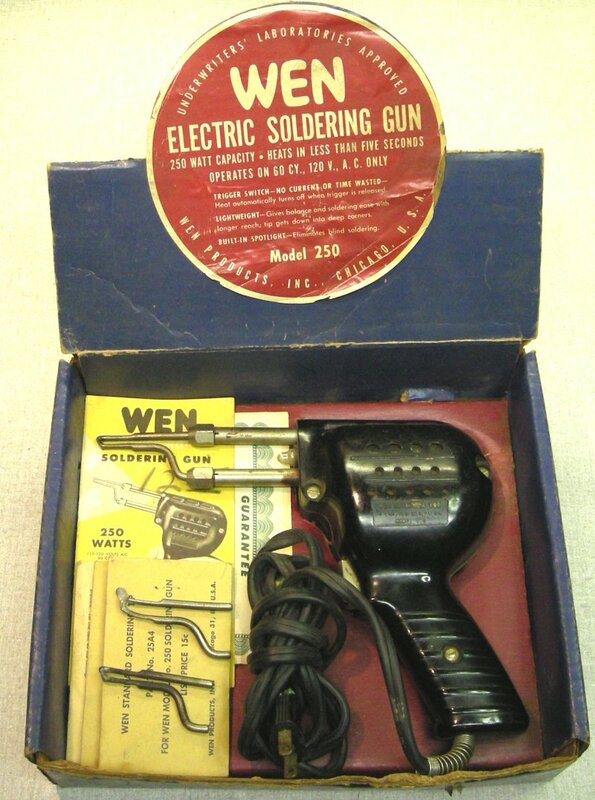 Model 250 (250 watt) soldering gun kit by WEN Products Inc. Chicago IL. 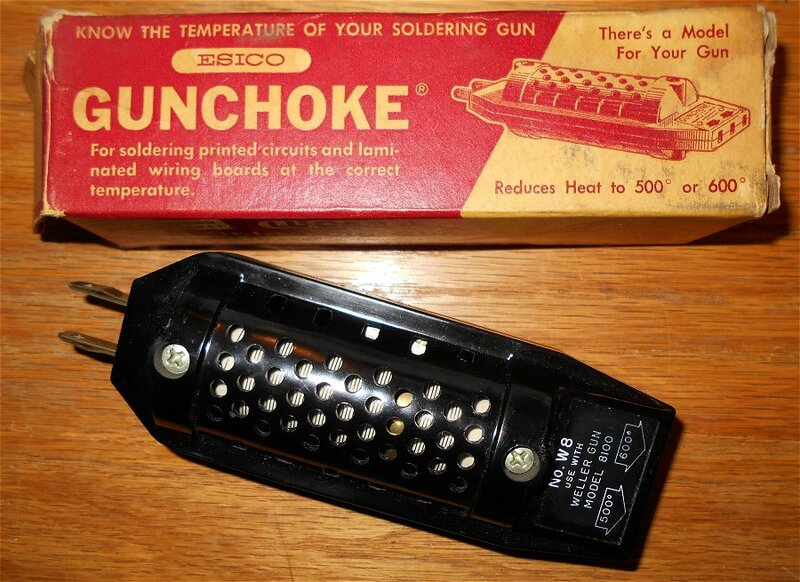 ESICO gunchokes limited the temperature of a soldering gun to 500 or 600 degrees to allow for soldering of early printed circuit boards which could not take the	high temperatures produced by most large soldering guns. 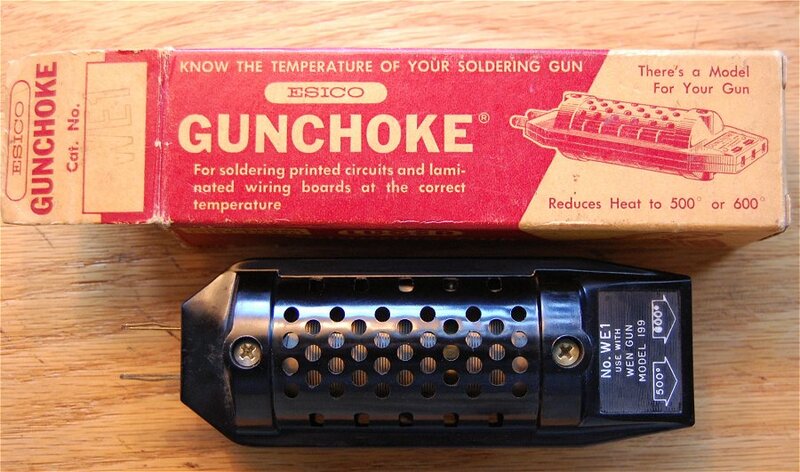 The gunchoke plugs into the AC source and the gun plugs into the appropriate plug on the end. 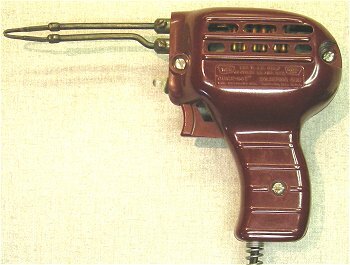 Sold by model/manufacture of gun. The particular gunchoke pictured is a model WE1 is for the WEN model 199 soldering gun above. 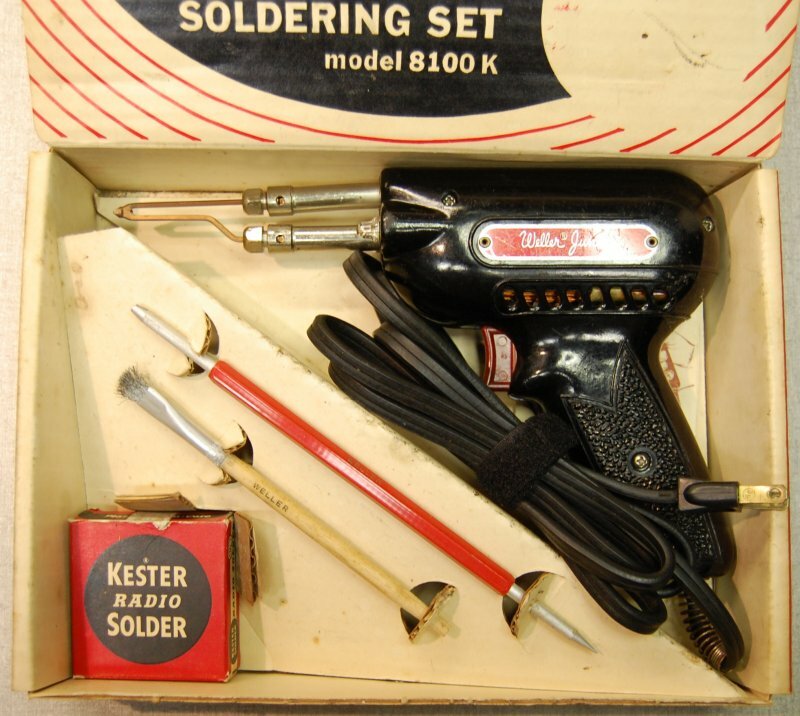 Manufactured by ESICO - Electric Soldering Iron Co. Inc., Deep River, Conn. U.S.A. in the late 1950s/early 60s. 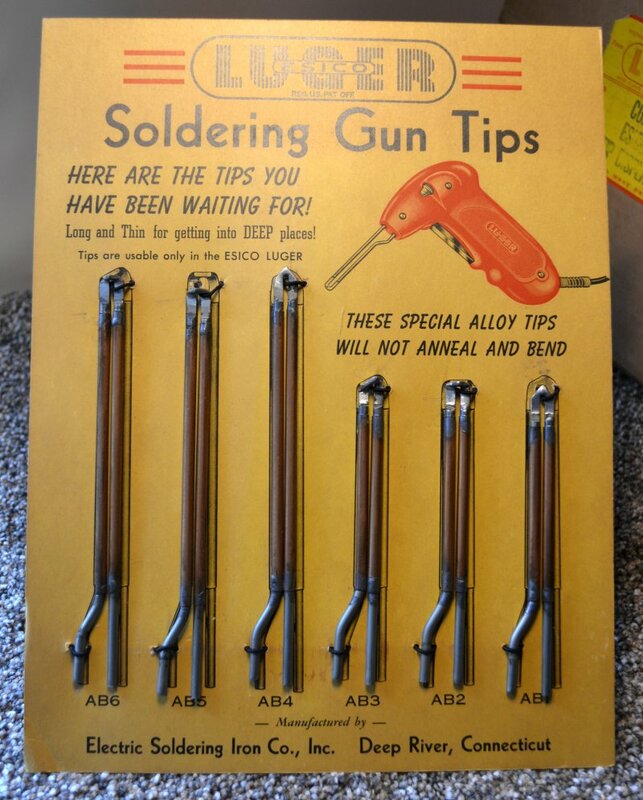 ESICO Counter Display Card for various Luger soldering tips available for the Esico "Luger" soldering gun. 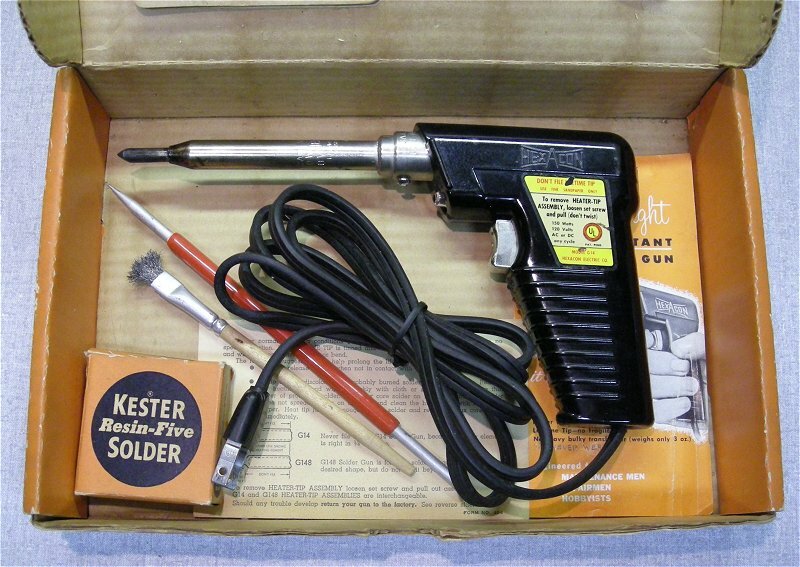 ESICO - Electric Soldering Iron Co. Inc., Deep River, Conn. U.S.A. 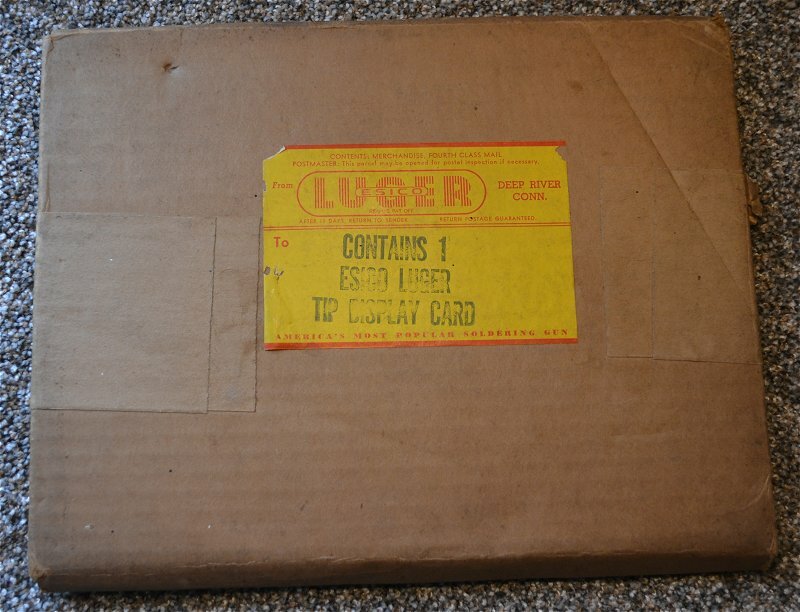 This beast weighs in at over three pounds. At 250 watts it's one of the largest in my collection. 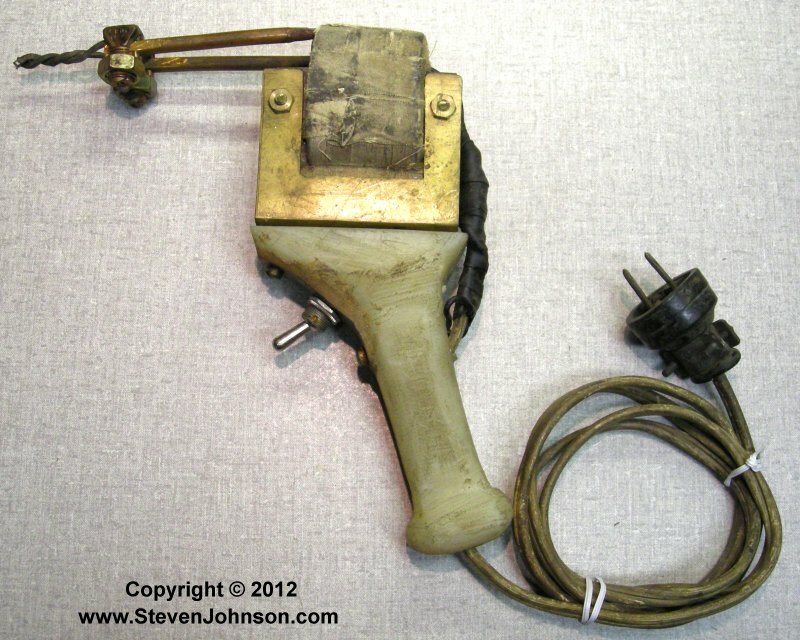 It proably spent most of its life in an auto shop. 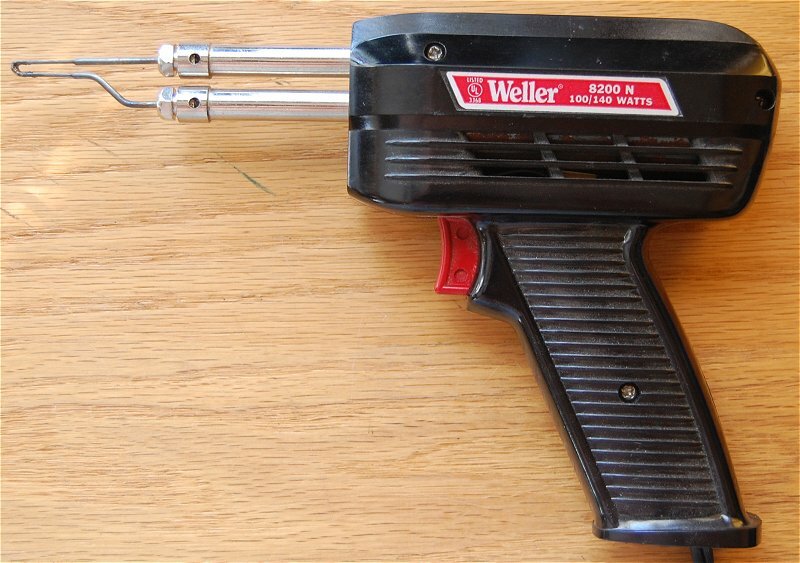 It looks like it was manufactured by Wen and the same as their model 250 above.